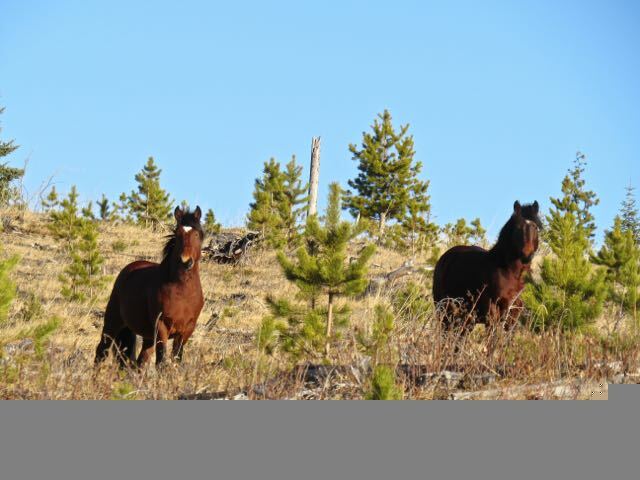 As December begins wild horse country has started to quieten down from all the traffic that surrounds the big game hunting season. Now a week later the wild horses are starting to change their movement and feeding habits back to normal. 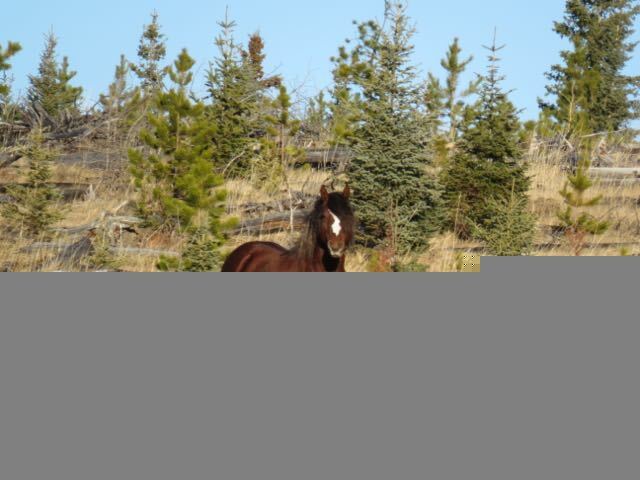 This beautiful mare stands peacefully looking out over her home range. Right now there is little snow covering the ground in most of the foothills and in some areas, there is almost no snow. 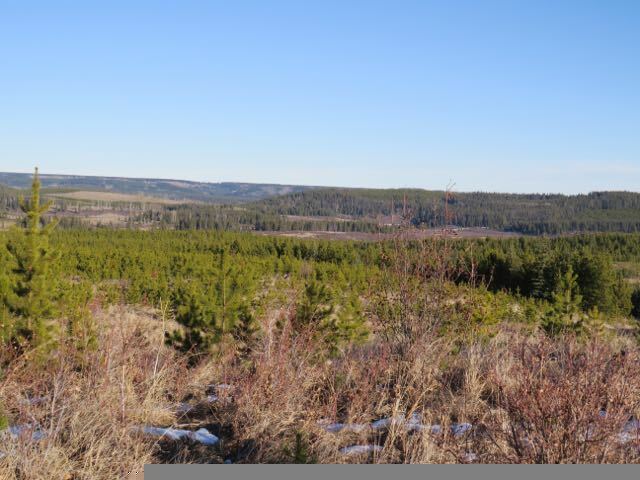 This is allowing the wild horses to continue to gain weight and body conditioning going into the winter months ahead. 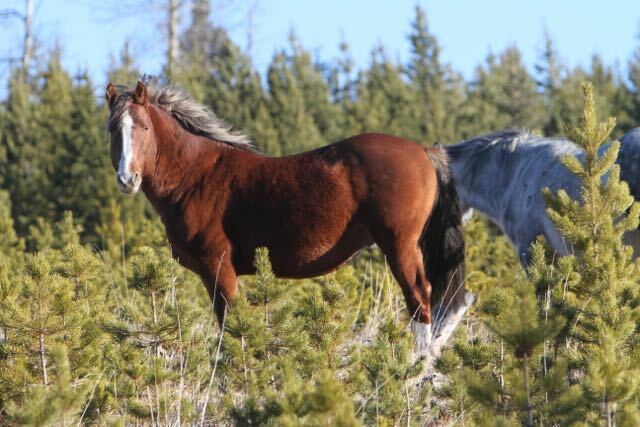 These two beautiful horses display the excellent condition that we are finding in the herds. Simply shiny and gorgeous! The handsome boy stands so proudly guarding his herd on a sunny afternoon. We treasure all these moments of being able to take in such special scenes. 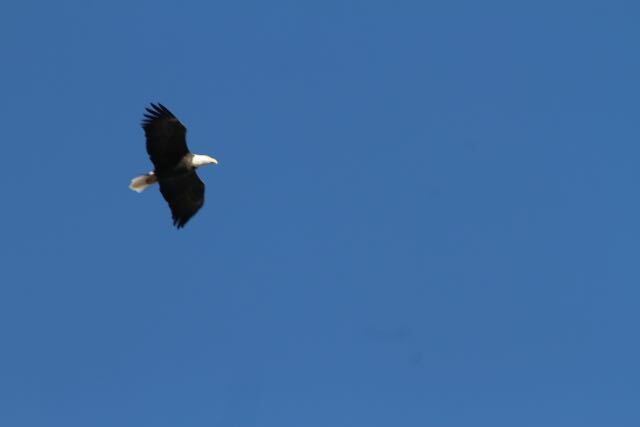 His herd was just below him secure in feeding on the hillside. The late afternoon sunshine makes this lone boy just stand out so dramatically as he rests at the edge of the forest. In the winter months the late afternoon sun can provide photographers such glorious opportunities to have its rays showcase any horses and other wildlife. On another day’s travel in different locations, we came across some familiar herds. 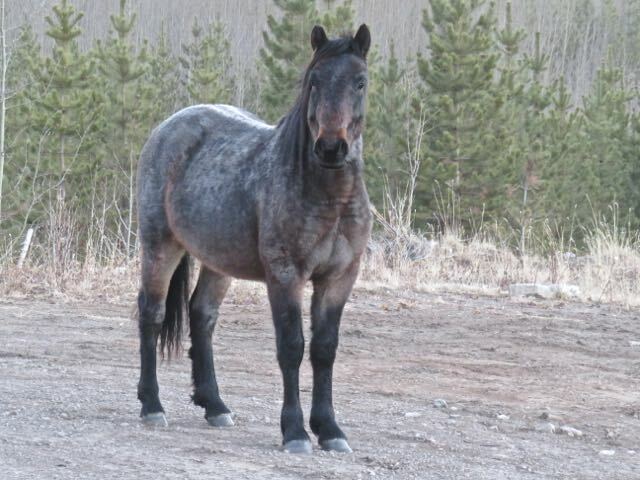 This little two-year old is the offspring of the magnificent stallion we call “Raven.” Her mother is a red roan and the stallion is pure black. Sensing we were not a threat, her curiosity got the best of her and she came right up close to us to have her picture taken. Travelling the back roads throughout the year, we often are entertained by the actions of not only some of the horses as well as other wildlife, both large and small. 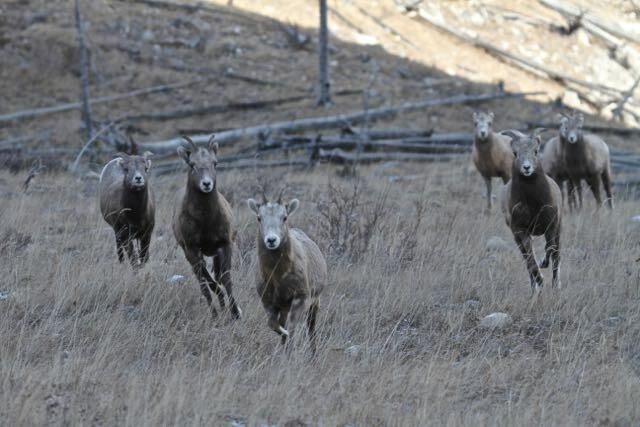 We came across this group of bighorn sheep feeding up on the hillside above the roadway. As we stopped to take photographs, they sprung into action and came racing toward us. At first we thought they were just going to run away. But no…. These wonderful creatures have learned that in the winter months, there is a good chance that any vehicle on the roadway is likely covered with road salt. This is a delicacy for them. Surrounding our vehicle they began to lick off the salt much to our enjoyment. Our dog who was in the vehicle could not figure out what was happening! We had to finally drive off leaving them to go back to feeding and as you can see they are in great condition too. Further along we came across this herd gaining their salt and minerals in a different manner. 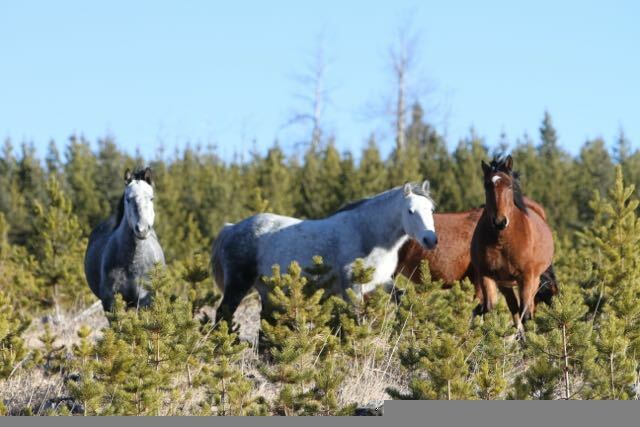 Although the sheep probably do it too, the horses here have found a location where the soil is naturally salty and full of other necessary minerals. They actually paw and eat the dirt to fulfill their needs. These horses didn’t care at all that we were just a short distance away watching them. Toward the end of our day, we came across this stunning stallion feeding in an opening. 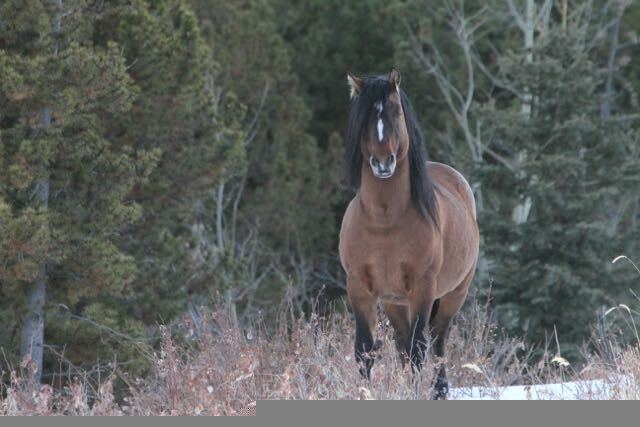 His long mane and forelock so exemplifies the beauty of the wild horses. 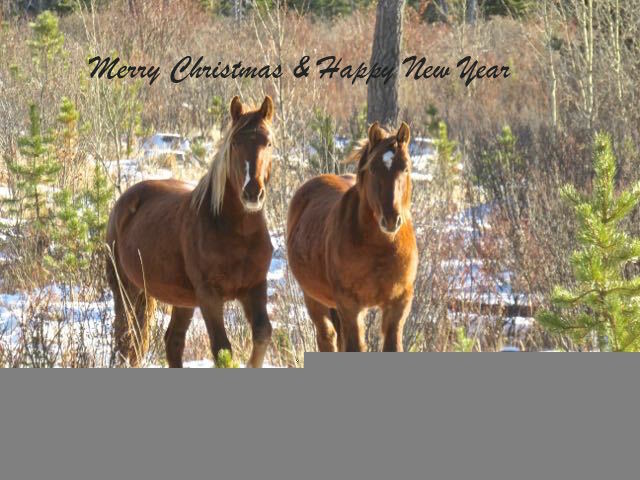 There is still time to order your 2019 calendars, the funds which go towards helping us protect and save these wild horses for all. See You at the Xmas Fairs! There is one picture of a beauty that I would love to have for a screen saver….but ONLY with your permission. Magnificent photos of our wonderful horses! I was wondering if anyone knows just how the proposed Bighorn Country Park plan is going to effect the horses in the west country?